Thank you for the link. If the snow data is correct then the wind is the only explanation that I can think of as to why the snow depth changes so much. The first attached image should the correlation of the recent ENSO and the mean global temperature anomaly until January 2013 (since then ENSO has been in the "neutral" range). The second image for early February 1992 shows a major crevasse parallel with the SW Tributary interface (note the streak lines show ice movement from Feb to Dec 1992). By examining the first image it can be seen that this major calving event occurred during a relatively strong El Nino period, when more CDW is advected beneath PIIS. Subsequent major calving events until 2013 all occurred with major crevasses roughly parallel to the SW Tributary Glacier interface (I suspect due to tension fields in the ice associated with: (a) the reduction in lateral restraint as the face of the ice shelf moves out into the ASE; (b) tidally induced flexural on the PIIS; and (c) compression, membrane shear and associated tension fields due to the SW Tributary Glacier ice flow interaction with the PIIS ice flow). The third image taken in late November of 2011, shows both a major crevasse and shear crack zone that formed in October 2011 (about a year after the moderately positive ENSO index in 2010, see the first image). The October 2011 major crevasse occurred several kilometers further upstream than normal (possibility due to deteriorating/thinning/rutting condition of the PIIS); however, the major calving event associated with the indicated crevasse did not happen until November 2013; and I believe that this two year delay from cracking to calving is likely due to the relatively cold water advected beneath PIIS due to the relatively strong La Nina event of 2011 (see the first image). The fourth image shows both natural light and infrared images of the PIIS on Jan 11 2014, showing continuing calving in the northeastern notch area associated with the extensive shear cracking zone shown in the third image. The fact that the calving in this notch area is continuing to extend upstream of the SW Tributary Glacier interface area (possibly due to the ENSO neutral condition melting the weak ice that probably formed in the shear cracks following the 2011 La Nina event), implies to me that the next major flexural/tension crevasse will likely occur still further upstream from the SW Tributary Glacier interface area than the location of the October 2011 crevasse formation. If I am correct then there is an increasing risk that the buttress support from PIIS on the SW Tributary Glacier will degrade relatively rapidly, particularly if a major El Nino event occurs within the next few years. The grounded berg in Pine Island Glaciers bay is on the move, anyone know the tidal range, or where I can find it? Conclusion: "Tides have been shown to play a significant role in ice shelf melting and circulation under the ice shelf in strong tidal regimes, such as the Ross and Weddell Seas, through the mechanisms of tidal rectification and mixing [Makinson, et al., 2011; Mueller et al., 2012]. Here, tides are shown to play a significant role in even in weak tidal regimes for ice shelves near the effective critical latitude. Selected ice shelves along the Antarctic Peninsula, in the Weddell Sea, and Greenland, which are near the M2 critical latitude, are likely to respond similarly. Tidal effects on the ice shelves in these areas near critical latitude result from internal tides, increased baroclinicity, resonance effects, increased mixing, and non-linear effects on the density-driven circulation, rather than tidal residual velocities. These effects can increase ice shelf melt rates by 25-50%." The attached image (from January 24, 2014) shows that the iceberg that calved from PIIS in November 2013 is clearly on the move (it was previously grounded until recently), and is very near the Thwaites Ice Tongue. The image also shows that: (a) the notch in PIIS looks a little bit larger; and (b) most to the land-fast sea ice around the Thwaites Ice Tongue appears to be breaking-up rapidly. For a sense of scale, (1) the grounded PIG iceberg is visible offshore; and (2) each pixel is 500 meters, so the cracks are both sudden and wide. The area covered in this huge event is far larger than the iceberg. Through the cloud cover one can see hints that in the four days since the continued loss of ice has been extensive, but no details. I was hoping to report a month to month comparison. I believe that what you are referring to is sea ice floating away from Thwaites; which is not related to glacial ice mass loss. This is a normal/annual event and does not contribute to SLR. As the image that I posted yesterday had a fairly significant amount of cloud cover, I provide the accompanying image from today (Jan 26) showing the same points that I made yesterday, except that it is clearer what is sea ice and what is glacial ice around Thwaites. While a bit cloudy, this January 29, 2014 infrared Terra images makes clear to me that there was indeed another medium sized calving event in the eastern arm of the notch yesterday. I would like to note that while calving is a natural event, this frequent of calving in this concentrated area is exceptional, and could contribute to stress concentration in the PIIS near the notch; which in turn could lead to another major calving event within the next few years. although clouds allow only partial view of the sea surface, this modis image http://rapidfire.sci.gsfc.nasa.gov/cgi-bin/imagery/single.cgi?image=crefl2_143.A2014030232000-2014030232500.2km.jpg shows that some of those areas in the sea ice extent map have fairly dispersed ice in them. I guess that still has a dampening effect on waves. While there is some thin cloud cover in this image, it is clean to me that this image not only shows: (a) the extent of calving on the north face of the notch that occurred yesterday; but also; (b) the length of the arm of the notch that is extending in the northeastern direction is longer than yesterday morning, indicating that minor calving occurred on this northeastern face as well. If it is not clear to the readers, calving on the northeastern face is particularly serious as: (a) the ice in this alignment is already fractured making more calving in this direction likely; and (b) calving along this alignment is more likely to contribute to a major calving event along the entire PIIS face (similar to what happened in Nov. 2013). which seem visible on many such images are likely to be more solid than fractured ice near the open western ends of these blocks and are these blocks likely to work their way free? If that were to happen, could the ice stream move more easily? Perhaps by changing direction slightly to the right because the eastern end would look more constrained then the western side? Is that a mis-interpretation of what I see or perhaps just wildly speculative? The PIIS ice mass is clearly not homogeneous, and it clearly contains some blocks/sections that are stronger than others, and the boundary conditions for different portions of the PIIS also vary. If what I labeled as blocks 1&2 were to calve off, then the "pinnacle" would offer less restraint to the PIIS (or ice stream); which in my opinion would make a major calving event more likely. If that is what you are referring to, then I agree with you (but these are also just my wild speculations). Sorry about the incorrect directions and missing photo. (Doesn't seem to be available here but if I click the link I have replaced it with, it does show for me but perhaps only me and I cannot find the image on flikr. The pinnacle seems to be within block 1 making that rather less likely to free itself soon. There has been some recent small scale calving activity at the western part of Thwaites glacier too as shown in the following images from January 11, 17 and 27. The arrows point to the changes at the calving front. Anyone have an explanation for the ongoing open water at that one spot? It has been visible in images for at least the last two months despite being surrounded by what seems to be bergs. The bergs seem neither to shrink in size nearby (indicating melting) or to enter the open water. If I read D in http://glacierchange.files.wordpress.com/2012/10/thwaites-bedrock-2.jpg correctly, the open water is behind the 2009 oceanic grounding line and likely where a deep water location with ungrounded ice is indicated. Have suitable currents or geothermal heat sources been reported in that area? Latent heat polynyas are regions of high ice production and therefore are possible sites of dense water production in both polar regions. The high ice production rates within these polynyas leads to a large amount of brine rejection into the surface waters. This salty water then sinks and mixes to possibly form new water masses." While what you point to is not a large polyna, nevertheless, at this location there are both katabatic winds, and there is a local warm water current advected to this location coming from the PIIS/PIG (see my first few posts in the "Surge" thread). Therefore, both wind and upwelling combined could account for the polyna. Next, the first attached image of the Thwaites Ice Tongue (north is at the left of the image) is from Google Earth circa early December 2013, with the grounding line shown in turquois (note the longitude and latitude written on the image are at the "W" in Walgreen Coast on the image. You can see that the old ice tongue iceberg that calved in October of 2012 (see the images and discussion in the "Surge" thread) is splitting away from the new ice tongue in the image, and the polyna that you refer to has not yet formed. 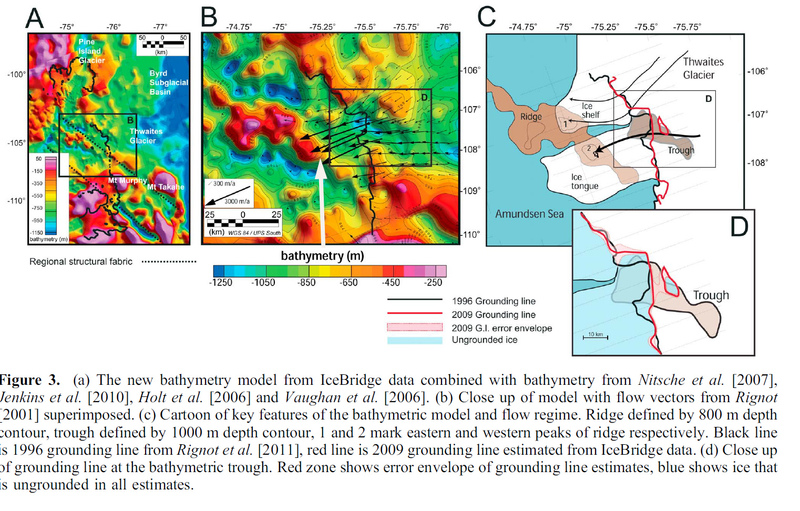 The second image shows some improved bathymetry in this area from the University of Texas (published in 2013) with longitudes and latitudes, and scaled dividing lines, for your reference. I decided to post this image of the PIIS for Feb 6 2014 by Aqua, not because it shows any new calving, but because it is cloud free and higher resolution then my last posted image. Aslr, thanks for your reply. However, I think further discussion is in order. You mentioned and embedded Google Earth images. Google Earth and map images are updated infrequently. For example, T]the zoomed crevasse image you posted is dated 1/26/2010. The lovely image you report as being from early December 2013 is dated 12/31/1998, long before several calving events. The images' dates are printed along their bottom edges. My preference is to use the MODIS Rapidfire daily image subsets for convenient comparisons. Because of the loss of historic images due to the failure of a disk that was not backed up, I cannot tell when the hole opened through. However photos dated December 2012, after the last major tongue retreat, do not show the hole. Thus the phenomenon is new and may be a coal-mine canary. Whether it is a traditional polyna is in question. A polyna is usually associated with seasonal sea ice, not ice shelves. The area where this hole is occurring was reported to be an ice shelf until recently -- as was the area I mentioned in a previous post -- and, to my knowledge, has not had seasonal ice for a very long time. Clearly the shelf has broken up. but into bergs of fairly uniform size; apparently crevasse interval-determined width. Polynas can be maintained by winds or currents, but winds work on bergs poorly because of their depth. In this case the open space is among tightly packed bergs. More likely in my opinion is that an upwelling is keeping the hole open. You suggest from the PIG, but I suspect from under the Thwaites. In either case, it would seem to require a tremendous sustained flow, not the burst-emptying of a pond, to force bergs so far apart and then keep them away. Several mechanisms come to mind, one of which is geothermal melting somewhere under the Thwaites. I don't have an answer to the cause of the open water, but I do wonder whether the TG's contribution to SLR is now higher than reported. Reading the posts, I thought this image might interest you. The corner of interest is in the path of Landsat 8 roughly every 8 days. Images on January 11, 18 and 27 are appear relatively cloud free. This is January 18, the other images are ordered from the USGS and I will make a sequence when available. For now it looks that the debris that is visible is from sea ice formed between the ice bergs. The image is processed to show natural color in with 15m resolution. Do not forget to click the attached image for the full resolution. Thanks for the corrections about the Google Earth images (Google Earth seems to be a mosaic of images with different dates in different parts of the mosaic). Thanks for the high resolution Landsat 8 image from January 18, and I look forward to seeing the sequence when it is available. Also, in order to focus future discuss between what is sea ice and what is glacial/ice shelf ice, and what changes have recently occurred in the ASE, I post the accompanying image from MacGregor et al 2012 which shows the recent history of changes in the ASE ice shelves, which helps clarify where the sea ice is and where the grounding lines are (although these are changing in real-time also). In this regard: (a) the polyna that steve s is referring to appears to be in an area that is currently sea ice; and (b) the fractured ice in the Landsat 8 image is fractured glacial ice and not sea ice, between the two difference portions of the Pine Island Ice Shelf. I would also like to say that we should all remember that most of the processes (changes) that we are seeing today have been going on for many years now, but I (and many others) are concerned when this on-going processes result in fundamental change in future behavior, leading to sea level rise. For example, the first image from Landsat in 2001 shows the same fracturing pattern in PIIS that Wipneus's post shows for 2014; however, the calving face has retreated back to the pinnacle that I referred to in my posts with crandles and should future local calving in the present day notch un-pin the many PIIS ice stream from the pinnacle then the calving face could retreat so far upstream that the SW tributary glacier ice flow accelerates and then reduces the stability of the Thwaites Glacier. "A novel method for predicting fracture in floating ice" by: Liz LOGAN, Ginny CATANIA, Luc LAVIER, Eunseo CHOI; Journal of Glaciology, Vol. 59, No. 216, 2013, doi:10.3189/2013JoG12J210) shows that the crevasse cracking in the ungrounded Thwaites Glacier is on-going, but Google Earth images that I posted show that similar cracks were occurring for many years now. However, the Thwaites Ice Stream in this area is thinning rapidly and calving associated with the crevasse cracking that Logan et al 2013 discuss appear likely to accelerate in the future, especially, since most of the basal water existing from beneath Thwaites appears to be existing from this rapidly thinning area of ice stream. Lastly, the third attached image of a computer model of warm water circulation in the ASE, supports that warm water does circulate underneath the area of the polyna that steve s refers to; but nevertheless, basal water leaking out from Thwaites would likely increase upwelling in this area; so who knows in any given year what processes does or doesn't clear-out the sea ice around the Thwaites Ice Shelve at any given time of year; I guess we will all have to watch and see how the patterns/processes change with time; but I am very concerned that during an El Nino event that the warm water circulation in and around both the PIG and the Thwaites Glaciers will accelerate grounding line retreat and ice mass loss. Some of those maps are right in time for me get acquainted with the geography around here, thanks you. The 27 January image seems to take ages to process, while other images are returned within hours. Here is a animation of Images from 1 December and 18 January. The calving is of course obvious, but you can also see the entire mass of ice has moved by 27 pixels down and 18 to the left, or about 490 meters. Of couse, without clicking nothing will animate. Thank you for the great Landsat 8 sequence from 1 December 2013 to 18 January 2014, it exciting to have someone with your skill set adding to this folder. It is great to be able to both more clearly see the fractured ice, and to see the face of the PIIS move outward with time. Also, once all the sea ice clears out from around the base of the Thwaites Ice Shelf (and/or Ice Tongue), later this austral summer, I would expect the calving that steve s was referring to will accelerate; therefore, if you have time in the next few weeks if would be great to a similar sequence for the base of the Thwaites Ice Shelf as what you did for the PIIS, expect in the area shown in the LOGAN et al 2013, doi:10.3189/2013JoG12J210, image in my previous post. The attached image is near the base of the Thwaites Ice Shelf, and I believe at the bottom of the image (the western side of the image) we see the iceberg that calved from Thwaites in October 2012 breaking up (I believe I previously said that this area might be sea ice but it appears to be glacial ice) together with some new blocks calving from the ice shelf. It will be interesting to see what this area and the PIIS look like by the end of this austral season. The first image from Google Earth is a mosaic of images from different years/times (which can create confusion), and I only post it here because the turquoise line in this image shows the approximate location of the Walgreen Coast (part of the ASE) grounding line. The second image is an annotated section of the Landsat image from January 30, 2014 of the area around the Thwaites Eastern Ice Shelf. This image shows that after the late October 2012 calving event (see the "Surge" thread) that the Thwaites Ice Tongue has largely calved alway, while the image shows that the iceberg from the October 2012 calving of the Thwaites Ice Tongue is trapped by landfast sea ice just west of the Thwaites Eastern Ice Shelf and is slowly disintegrating. The third image is from MacGregor et al 2013, and shows: (a) bathymetry and hand drawn ice shear boundaries and (b) the lateral shear strain rate showing how fast the ice velocity decreases laterally (at right angles to the direction of direction of ice flow). The fourth image is from the University of Texas of ice flow velocities circa 2009 (note the MacGregor lateral shear strains split from right-handed to left-handed shear along the center line of this ice velocity flow lines), and note that this images shows the old iceberg from the circa 2011 calving event of the Thwaites Ice Tongue (that has since moved away). Again, I hope that these images add some clarity rather that more confusion. The Jan-27 that I ordered finally came in this morning. The sequence shows quite visible the movement of the ice sheet, 9 pixels down and 6 to the left = 165 meter total. The ground glacial ice between this ice and the ice fasted to the land is giving way. Some compression is visible between stationary ice to the lower half and ice moving with the pack more to the top. Of course assuming that you did click the attached image. (1) In past years similar "notches" have occurred but always further to the West by Northwest, thus indicating that the calving face of PIIS is retreating upstream, and once clear of the pinnacle that I previously discussed, the ice stream velocity, and probably the rate of calving, will likely accelerate. (2) At its current rate of movement "Block 1" should move beyond the "pinnacle" well before the end of this austral summer and thus may be subject to local calving this year. (3) When looking at the MacGregor et al 2013 figure in my last post showing rate of change of lateral shear strain, it is clear that the shear restraint on both the right and left (note you look downstream when determining what is left and right) boundaries of the PIIS ice stream are still exerting shear restraint (possibly due to compression across fractured ice along the boundaries). Lastly, I post the accompanying Modis/LANCE Terra images from Feb 9, 2014 showing that while there has been more calving in the notch since January 27, there has not been much, if any, calving in this area since Feb 6, 2014. While I cannot say with certainty bases on the Modis/LANCE images, but the attached Terra images from Feb 11, 2014, make it appear as though the PIIS ice stream has lurched forward (moved the ice face downstream), resulting in the displacement of floating fractured glacial ice from within the notch (or possibly a calving event from the face of the ice stream). If the ice stream is moving this fast (i.e. if the images are not distorted), then it appears that ice mass loss from PIG is clearly accelerating in real time. As I found the apparent downstream movement of the face of the PIIS ice stream so exceptional from the Terra image on Feb 11 2014; I decided to post the Aqua image from earlier in the day from Feb 11 2014. To my mind the apparent difference of the location of the face of the PIIS ice stream in the two sets of images, implies that Block 1 came unpinned from the pinnacle and surged forward. As I am much more low-tech than Wipeus, I proved that attached image from Google Earth in the PIIS notch area (before the notch formed but after the November 2013 major calving event), with a 5km long line as a scale reference. Looking at the Terra images from Feb 11 2014, it occurs to me that a more reasonable explanation than the entire PIIS ice stream lurching forward, it that Block 1 probably has broken free from the PIIS ice stream, probably due to forces associated with its possible prior pinning on the pinnacle. If so this would mean that ice mass loss from PIG need not be accelerating quickly; but would mean that the rest of the PIIS ice stream may be temporarily un-pinned from the pinnacle, and thus temporarily subjected to a higher risk of a major crevasse forming across the body of the ice stream, until the ice stream moves sufficiently downstream to become pinned again. I guess that we will need to wait and watch as future images become available.